Celebrate Mathematics Month with Our Most Mathy Blog Posts! April has just begun, and it also happens to be Mathematics and Statistics Awareness Month! The goal is to increase public understanding of and appreciation for mathematics and statistics. Here at ThinkFun, we strongly believe in the power of learning through play which has led us to developing games that strengthen children’s math skills. For those of you who would like to celebrate Mathematics and Statistics Awareness Month, we have compiled and highlighted some of our favorite math-related blog posts that have been published in our education blog. To most people, the importance of math is obvious. Kids, however, sometimes need convincing. This blog post cites the reasons why math is important and can provide parents or teachers ideas to combat the question “Why do I need to learn math?” First, learning math makes you smarter altogether and can be important for teaching ‘how to think’ rather than ‘what to think.’ Additionally, there are several professions that require math in order to perform well! Take a look at this blog post to see what other reasons learning math is important. This blog post gives an overview of math. Did you know that, before there were calculators, people used to use a device called the Lebombo Bone to calculate numbers? Not to mention that the very first math textbook that was ever published didn’t contain any numbers! This fun and informative blog post may surprise you with math history facts you would've never guessed before. Click here to read the blog post! If you’re looking for new games to make math more fun, this blog post is the one for you! This blog post ranks the top six games that are the best for teaching math and the reasons why these games are so fun. Of course, games like Math Dice and Balance Beans are listed but there are other games that may surprise you such as Dino Math Tracks and Sum Swamp. If you’re thinking about increasing your math game library, this blog post is worth checking out! This blog post takes an interesting look at the correlation between money management and the importance of teaching mental math to kids. There’s evidence that shows that kids who hone their mental math skills build on their foundational math skills while also taking more of an interest in projects or classes in the STEM fields. Mental math skills can be taught easily with three mental math games—click here to learn more! Take a trip down memory lane with this blog post! Math Dice is the best mental math game and a favorite for teachers to use in the classroom due to its ability to help students build math fluency skills. Did you know that this awesome game was actually invented by a 6th grader? 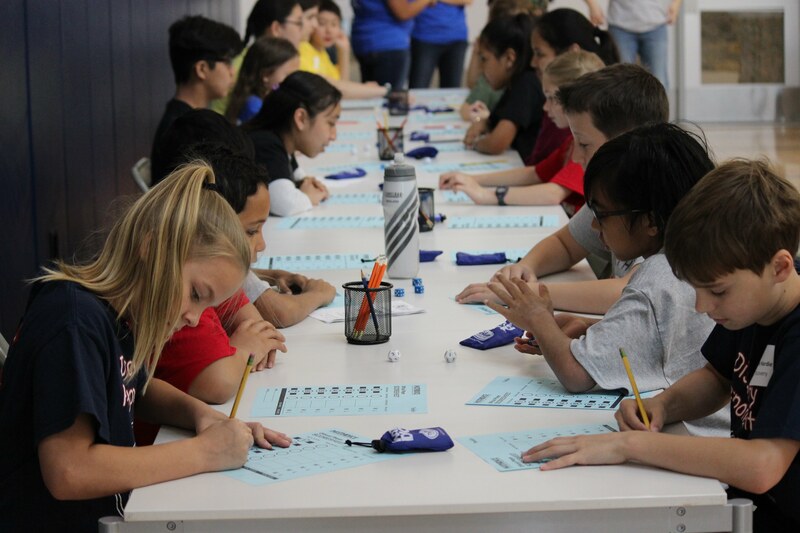 This blog post recounts how Math Dice, originally called “Dice Mania,” came to be and how the game sparked the creation of the Math Dice Classroom Program. Are you a teacher interested in learning more about this program? Reach out to Alana by emailing education@thinkfun.com to learn more! Math isn’t everyone’s favorite subject. For teachers that struggle with keeping students engaged in math class, this blog post offers some creative ways to inspire and excite students. One way is by teaching with math stations. The strategy behind this is to break up the math lessons into parts. Another way is through trial and error. Trial and error is a great way to see if the lessons are exciting enough or if they need to be adjusted in the future. Integrating games into the classroom is another way of sparking excitement too! For more information on how to engage students in math class, click here. Are you a former or current educator who is interested in guest blogging for ThinkFun? Please contact us for more information! You could be featured in our next blog post and TeachFun e-newsletter!